SHRM's global HR credentials, SHRM-CP and SHRM-SCP, offer growth, advancement and recognition. By becoming SHRM certified, you prove your knowledge, competency and value to colleagues and to employers looking for a competitive edge in today's global economy. Wherever your career takes you, your SHRM certification will define you as an HR expert and leader. Ensure you're prepared for the exam with our course designed for SHRM credential candidates. Expand and test your knowledge and practical, real-life competencies in areas critical for HR career success. Our Saturday classes combines expert instruction with the 2019 SHRM Learning System®, so you will learn faster, retain more knowledge and stay on track for success on the exam. Manhattanville offers you a preparation course tailored to help meet your needs as an adult student and increase your success on the SHRM-CP and SHRM-SCP exams. Our course is designed to help you learn and retain the material effectively and efficiently by combining the best exam preparation system with expert instruction and peer discussion. A high-level review of course material. Interactive discussions and learning activities focused on the practical application of HR competencies and knowledge. Study and test taking tips. Download the article, Approach Your Manager for Support, to help you make a case for your training request, draft discussion points for an in-person meeting, and craft an initial email to your manager. Earn up to 36 recertification credits if you are attending this program for professional development only. The SHRM Learning System delivers the most comprehensive, flexible and effective exam preparation. Online learning modules and interactive study tools, testing your knowledge and decision making skills, are incorporated into the study process. As an official SHRM Education Partner, we are able to build our course on the SHRM Learning System, giving you access to the most effective and up-to-date exam preparation tools available. 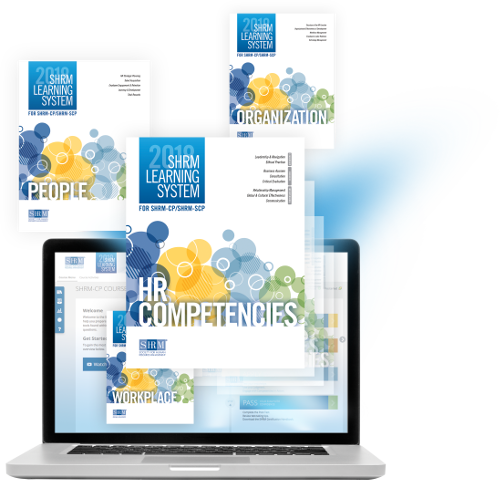 The curriculum provided in the 2018 SHRM Learning System is designed by global subject matter experts and covers the entire SHRM Body of Competency and Knowledge™ (SHRM BoCK™). Effective and proven. Candidates who use the SHRM Learning System consistently beat the average exam pass rate. Most current and relevant. The SHRM Learning System has been updated to align with the 2018 SHRM BoCK. If you’re looking for uninterrupted access on-the-go, download the modules to your e-reader device. For how long should I plan to study to prepare for the SHRM certification exam? While your study efforts will be dependent on your current experience and knowledge of the content, we generally recommend that you study a minimum of 60 hours to adequately prepare for the SHRM-CP or SHRM-SCP exam. Your time could be reduced if you feel comfortable with a particular area. One of the unique tools within the Learning System is the SmartStudy tool, which provides you with a detailed plan to study based on your experience and knowledge. What is considered a passing score on the certification exam and how does it relate to the post-test in the Learning System? The results of the certification exam are reported as scaled scores on a range of 120 to 200. The passing scores for the SHRM-CP and SHRM-SCP exams are set using the Modified Angoff method, a best-practice procedure commonly used for setting performance standards for certification and licensure exams. We encourage students to strive for 80% or higher on the Learning System tests, including the post-test, but to be mindful of the potential for memorization (rather than application of knowledge) since the test questions are repeated in randomized order. Hear what HR professionals have to say about the SHRM-CP and SHRM-SCP exam! Registration for the SHRM Certification test is additional and is paid directly to SHRM. Interested in training your team? Ask about volume discounts or offering a program at your location. Contact Nancy Urell at nancy.urell@mville.edu. SHRM determines eligibility for the exam and all exam registration processes. Manhattanville is pleased to provide workshops to help you recertify for your SHRM CP or SCP Certification. Manhattanville is an approved SHRM Recertification Provider and our instructor led workshops have been preapproved for professional development credits (PDCs). Please click on the individual link below to view the course description and registration information. Click here to join our mailing list for information on SHRM Recertification Workshops and Future SHRM CP/SCP Certification Prep Courses.